The past two Mondays I spent the same hour of the day at the same park with the same two little boys. Last Monday, my friend Julie and I sat at a picnic table as the boys jumped in daring arcs to avoid the dark blue design in the rubber playground surfacing. We had to shift where we were sitting so we could talk without shielding our eyes. I peeled off a layer. The sun had a rushed intensity, like we were the final time zone on the conveyor belt, something to get through before clocking out. This week the same picnic table was shaded by the time we arrived, the sun looking bigger and oranger than it had the week before, and already off behind the fir trees. I rubbed my lower arms with my hands while my son and his friend darted in and out of the bushes at the foot of a hill. When had fall arrived? When I got home I looked it up: the equinox had come and gone on Saturday, sneaking in on a day with a high of 68. It’s fall, then. No matter how many 70-something-degree days are roped together, no matter how little rain. It’s fall and time has ground to a lush, climactic halt. After the kids are settled in their classrooms (no matter how dramatic that process turns out to be) I come home and it’s quiet. I can contemplate something frivolous, like a tart. 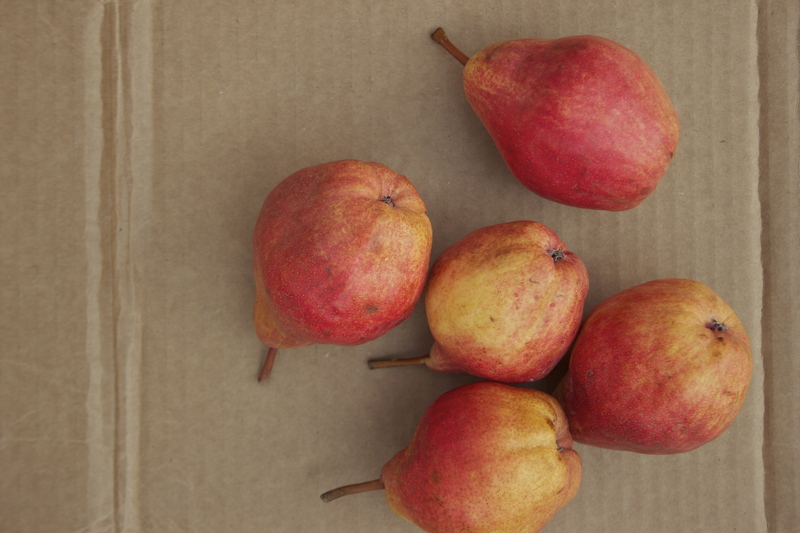 The pears I bought were bruised and a few had holes from being skewered by the stems of other pears, so ripe that the guy at the fruit stand sold them to me for a dollar a pound. Just how they’re supposed to look when they’re ready to be eaten. For the crust, I went searching. I like Mark Bittman’s unpretentious “free-form” tart. It’s made without tart pan or artisanal fussiness, calling only for a rich crust pressed onto a cookie sheet with sliced fruit dumped on top and a topping of brown sugar and butter. Done. I also like Smitten Kitchen’s version, mainly for her enthusiasm about discovering how to make a crust that doesn’t shrink. Her version with frangipane (on the to-make list) is more dependent on time and careful artistry. I looked at Chow’s recipe too, plus a few others online and in paper-and-ink cookbooks. What I came up with is a crumbly crust that browned evenly, didn’t shrink and contrasted nicely with the sweet pears and a small scoop of vanilla bean ice cream. *I prefer my crust to be as far from sweet as possible. If you like it sweeter, adjust these amounts to suit your taste. Sift flour, sugars and salt together, straight into a food processor bowl fitted with a metal blade. If you’re using raw cane sugar, not all of it will go through the sifter. That’s okay. Just dump any remaining crystals on top. Pulse a few times. Cut 7 tablespoons of chilled butter into small cubes and set aside the remaining tablespoon for topping the fruit at the end. Sprinkle cubes of butter over the flour mixture. Process for 5-10 seconds, until butter is incorporated. Combine egg yolk and lemon zest in a bowl and mix very lightly with a fork. Add to the food processor and pulse until the mixture becomes a collection of crumbs. At this point, you have two options. Set as-is in the refrigerator to use as a crumb topping. 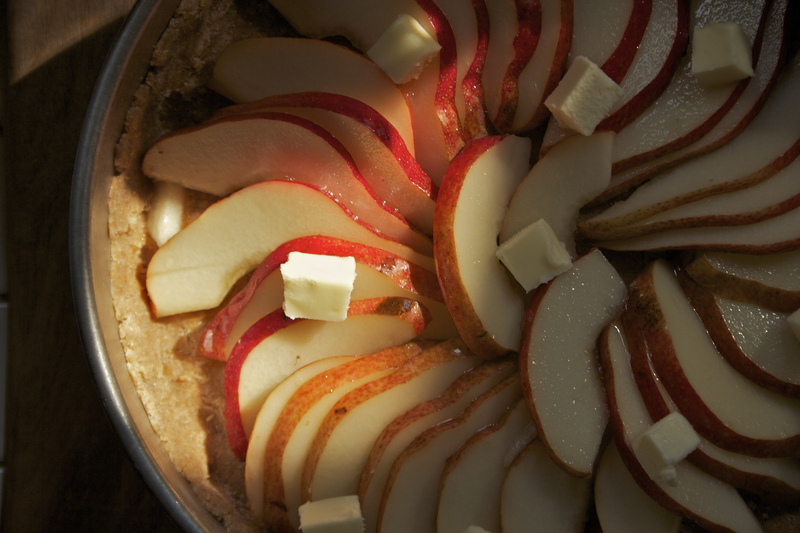 Prepare fruit, place in a 9” pie plate and top with crumb mixture. Press lightly and bake. If you prefer to make it more tart-like, spatula the mixture into a bowl and add ice water by the teaspoon (I used about 4 teaspoons), mixing with your hands until it holds together when pressed. 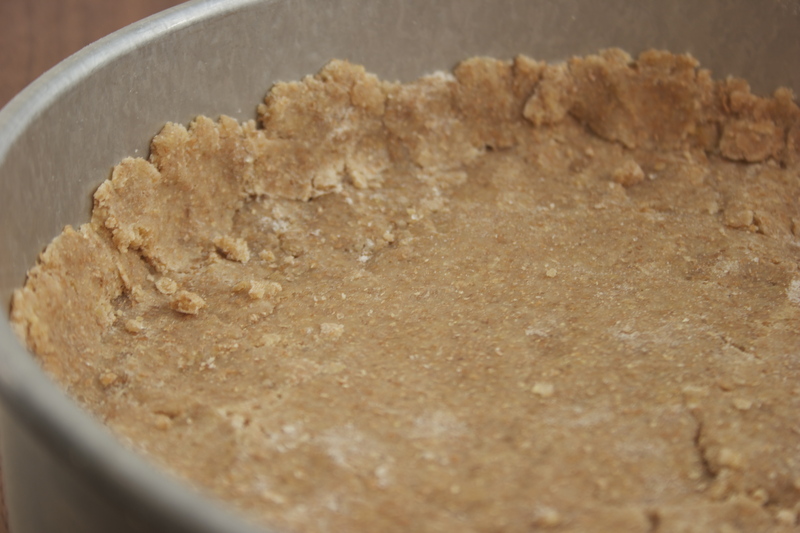 Then, working efficiently, press the dough into a tart or cake pan, creating a one-inch lip. You need not do this artfully. Refrigerate while you prepare the fruit. Note: this dough will not roll out. It’s too crumbly. If you freeze or refrigerate it, you’ll have to wait until it’s warm enough to work with to press it into the pan. While dough is chilling, squeeze lemon juice into a small bowl. 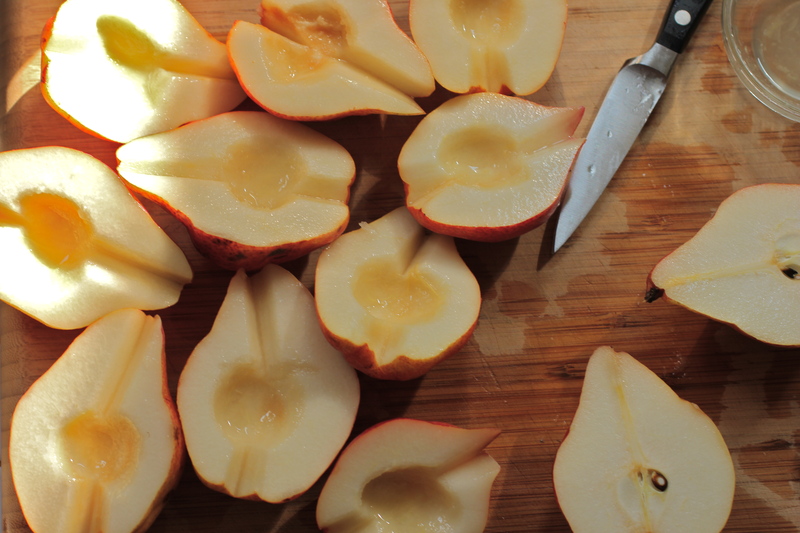 Slice pears in half and remove seeds and woody portions of the fruit with a spoon and paring knife. Rub exposed flesh with lemon juice. Remove crust from the refrigerator. 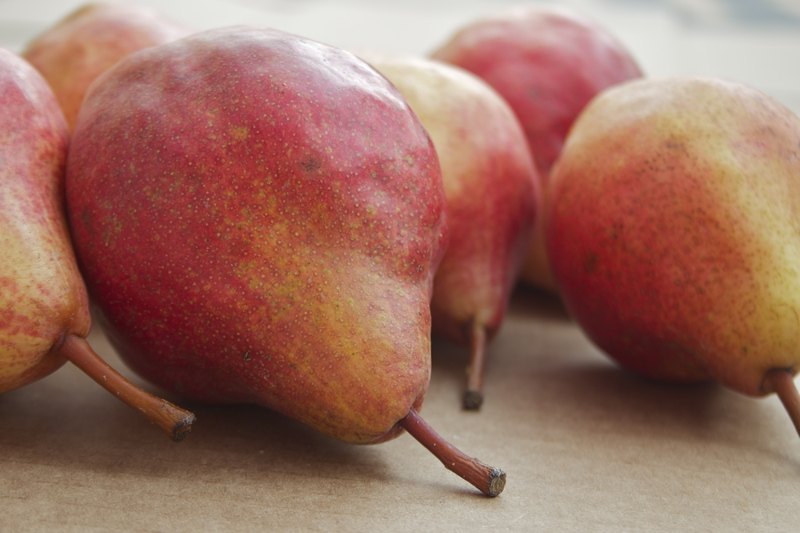 Place pear halves cut-side-down and slice lengthwise into ¼-inch slices. Arrange on top of the crust however you’d like and rub exposed surfaces with lemon juice. Mix one tablespoon of the maple syrup with remaining lemon juice and brush over the surface of the pears. Cut remaining tablespoon of butter into small cubes and use to dot the top of the tart. Place in oven on the center rack and bake for 30-40 minutes or until the crust is golden. Remove from the oven and, while the tart is still hot, brush pears with remaining tablespoon of maple syrup to give them a little gleam. Allow to cool slightly before cutting so the crust keeps its shape. This crust is crumbly, like a dry shortbread, so include a small scoop of good quality vanilla bean ice cream if you’d like, to balance it out. This entry was posted in Fall Fruits, Recipes and tagged Butter, Egg, Local, Organic, Pear, Salt. Bookmark the permalink. What a stunning tart, Jenni! I love everything about it. 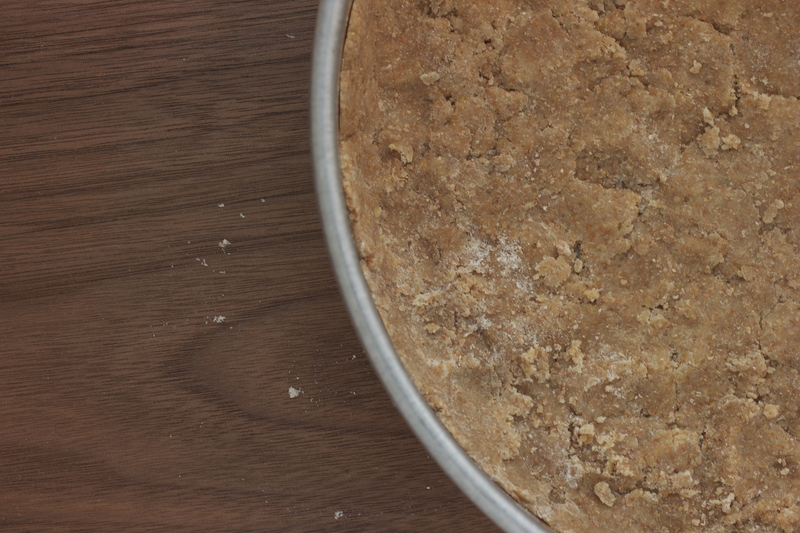 Your crust looks amazing – I’m always a fan of whole wheat flour. 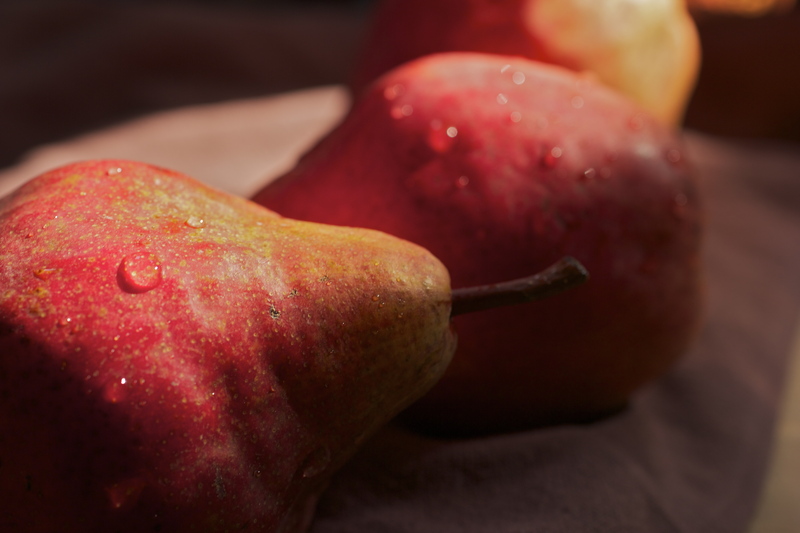 Maple and pears sound so delicious together. 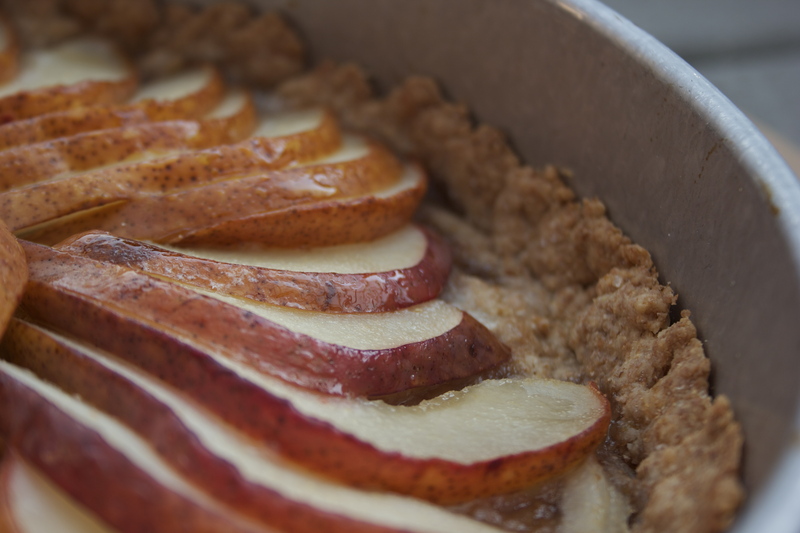 I can’t wait to bake this one – perfect to welcome fall! Thank you, Hannah – I’m glad to hear it looks good, especially coming from you! I love whole wheat flour too. I always hesitate to mix it with white flour because I think if it can work, I should try to make it completely whole grain. And, yes, such a lovely season we’re in. I feel giddy, welcoming the pears. Aw, thank you for your kind words! I prefer the taste and texture of whole grain/not very sweet goodies so much more now. And giddy is a terrific way to describe the feeling of this season! As much as I adore summer, I love fall cooking more. Again, your writing is superb and the photos are rich in color, texture and depth. I want to be there in the kitchen with you and sit down and eat a slice of maple-glazed pear tart with you. We must make time to do this, Woesha! Or at least a cup of tea. I so appreciate your encouragement and faithful reading! This looks spectacular! Such a wonderful way to use pears. And the photos are gorgeous! Thanks so much for visiting! It was really fun to make (and eat). Oo. I’ll go look in my Moosewoods to see if I can find it. 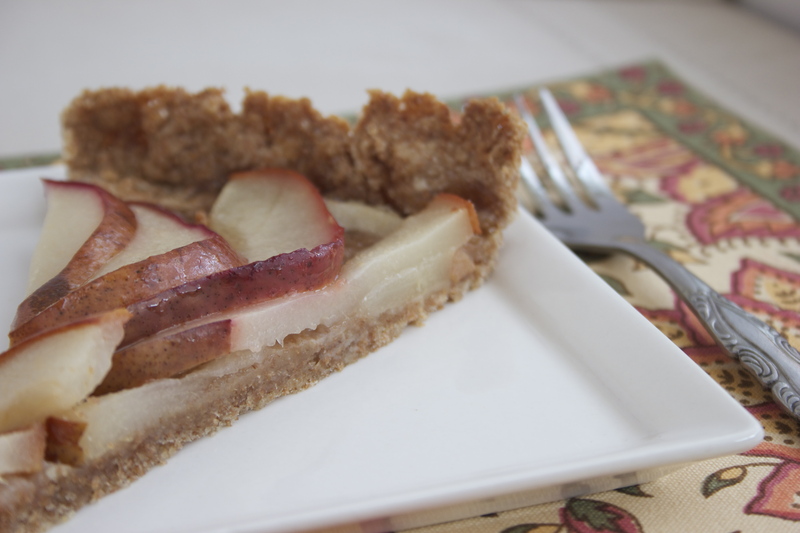 There are so many marvelous pears and now that the tart is gone, I may need to make another one! Looks so scrumptious! Love this tart! Beautiful, as usual. And I’m sure it’s delicious! Ah, thank you. Indeed. I think I’m going to make another before the pears are no more.